Neovim is my favourite editor, so it was only natural for me to try and use it as my python IDE. Setting it up was not an easy task because I haven’t programmed in ages, neither do I have serious experience with Linux. Before I get into the nuts and the bolts let me tell you about my setup. I use ArchLinux and I try to make it my daily driver, but it’s not easy because I work for a Microsoft shop. 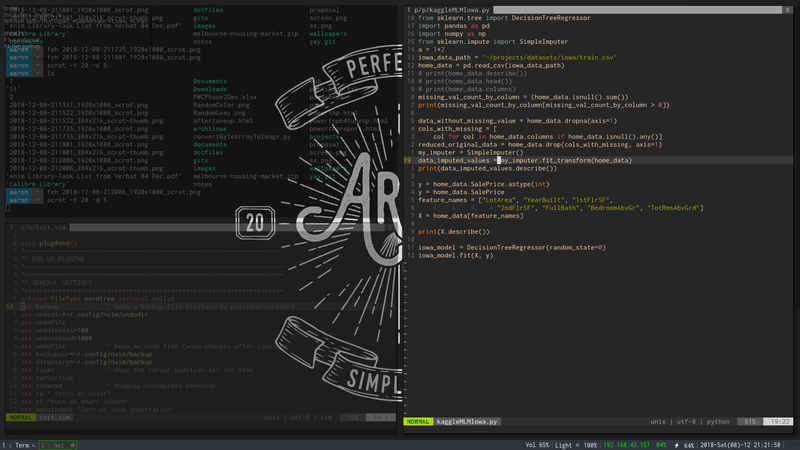 URXVT is my terminal emulator of choice and its housed in the I3 window manager. I use the patched URXVT downloaded from the AUR (You don’t have to go for the patched version. I got it because I thought it would help me to use the Powerline fonts and symbols in Neovim. I still haven’t got that to work.). I also got Neovim from the Arch repository. The four things in an IDE that I was looking for was Autocompletion, Linting, Code Execution and Repository integration. With the right plugins, NVIM does all that for you. My setup is heavily based on this excellent article written by Yufanlu. Might I suggest that you head over to his site to get your setup, up and running because I don’t think that I can give you better instructions. But, before you go, I have a few suggestions for you, if you are a naive user. Do not use the Arch repository to install anything related to configuring NVIM, Use PIP2 or PIP3 instead. If you have stuff from Arch, uninstall it. It just didn’t work for me. I tried using Pymode and YCM but it just didn’t float my boat. Pymode was slow, and its configuration was a bit cumbersome. YCM, on the other hand, was like a bulldozer. I needed something light and small. YCM also requires you to RTFM. Not my forte. I gave up on powerline, devicons etc because I failed to get it configured on Nvim. Anyway, I ended up using NCM2 and it seems to work without a glitch. Never got a chance to check out Deoplete. I got rid of rope because it was slow. F1 – run’s the python code. Linting is done during writes. I didn’t do any repository integration. This entry was posted in Arch Linux and tagged annotation, Arch Linux, hinting, ide, neovim, python, typing, urxvt. Bookmark the permalink. if you are interested in my vimrc file, it’s on git.